Update: Empire Line Service is now being restored between NYC and Albany, according to Amtrak. 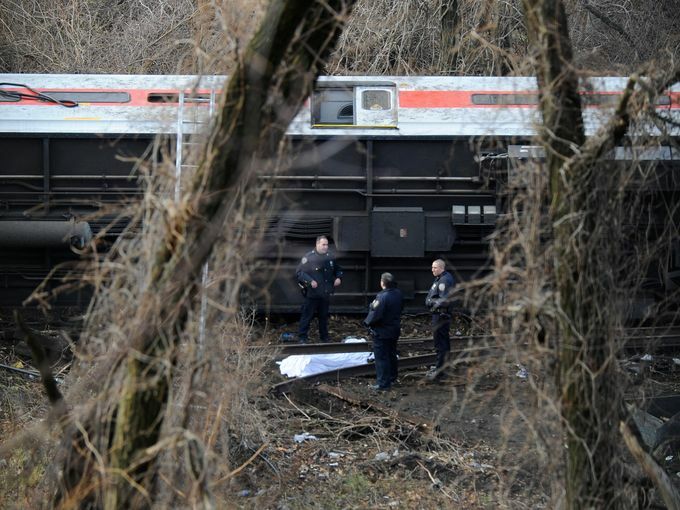 Four people were killed after a Metro-North Railroad train derailed Sunday morning in the Bronx, officials said. A total of 67 people were injured, including 11 critically, a New York Fire Department spokesman, Jim Long, said. 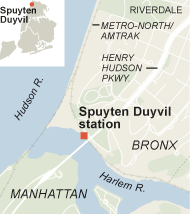 The derailment occurred when several cars of a Hudson Line train headed south from Poughkeepsie, N.Y., left the tracks about 7:20 a.m. just north of the Spuyten Duyvil station near where tracks pass under the the Henry Hudson Bridge , according to a Metropolitan Transportation Authority spokesman, Aaron Donovan. At a news conference, Gov. Andrew M. Cuomo said the operator of the train was among the people injured and was being treated. The families of the four victims had not yet been notified as of midmorning, he said. “It’s obviously a very tragic situation,” Mr. Cuomo said. Three of the four people who were killed were thrown from the train during the derailment, said Edward S. Kilduff, the New York Fire Department’s chief of department. 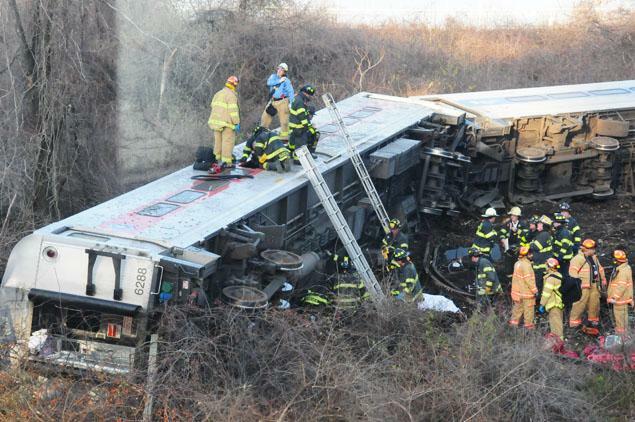 Fire Commissioner Salvatore J. Cassano said that there were about 100 people on the train, and the crash could have been much worse if there had been more passengers. “On a work day, fully occupied, it would have been a tremendous disaster,” he said. Any curve in the tracks would have speed restrictions, officials said. They said that investigators would examine the track, the equipment, the signal system and the operator. Joel Zaritsky had just fallen asleep in the fourth car of the train when the train started to roll over and landed on its side, he said. Mr. Zaritsky, who lives in Poughkeepsie and was heading to New York for a convention, said his hand was cut and he was very bruised. 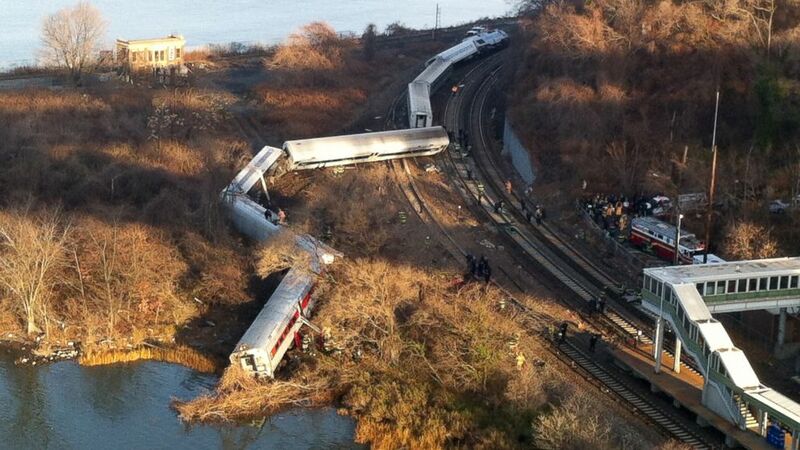 The National Transportation Safety Board said that it was sending a team to New York to investigate the derailment. 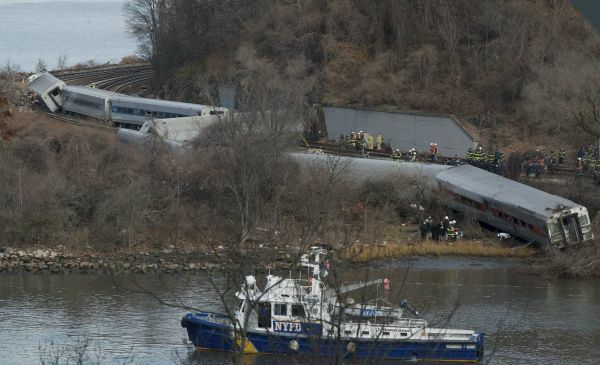 Rescue workers from the Police and Fire Departments converged on the scene and lowered stretchers into the train cars, which were lying on their sides; one car was just above the water. Many local residents at the scene described being awakened by a prolonged crashing sound. Some said it was a quick series of booms and then they saw several train cars on their sides away from the tracks. Several crashed cars lay on their sides for about 10 minutes, he said, with no visible commotion. “They were trapped inside the cars,” he said of the passengers, until emergency responders arrived. Firefighters arrived and climbed onto the toppled cars with ladders, opened the passenger doors and lowered ladders into the car and “started pulling people out,” said Kevin Farrell, 28, a hospital administrator who lives in a co-op building overlooking the crash site. He said he watched passengers being helped out with arms in splints or other minor injuries, and several of them were taken by stretchers. Responders rushed the passengers to ambulances through a section of a chain-link fence that they had removed. Councilman G. Oliver Koppell, who represents the area and was at the scene, said the accident was “certainly the worst one on this line” and added that it occured on a curve that is usually taken at low speed. “Trains generally slow to a crawl,” he said. The train was the 5:54 a.m. out of Poughkeepsie, and was due at Grand Central Terminal at 7:43 a.m.
All service between the Croton-Harmon station and Grand Central Terminal was suspended, Mr. Donovan said. Mayor Michael R. Bloomberg did not attend the morning news conference or visit the scene of the accident in the Bronx. A spokesman for the mayor’s office did immediately provide answers to questions about his whereabouts. Officials said that anyone who thinks they might have a relative involved in the crash should call 311. Ryan Kelly, 26, of Yorktown Heights, was traveling into the city on the train on Sunday morning for his job at Century 21 in TriBeCa. He was listening to Christmas music on his headphones and had fallen asleep when the train began to tilt over and he heard a screeching sound, he said. There were five people on his car, and one was taken out lying on a board, he said. Mr. Ryan injured his hand and his bicep. There was “dirt and soot everywhere,” he said.